8 11" x 16" unmounted (heavy paper) geoboards (EE, FF, GG, HH, II, JJ, KK, LL), 1156 die-cut counters, 4 pages rules, 1 sheet of overlays (w/3 overlays: JJ1, KK1, LL1), 12 scenarios. 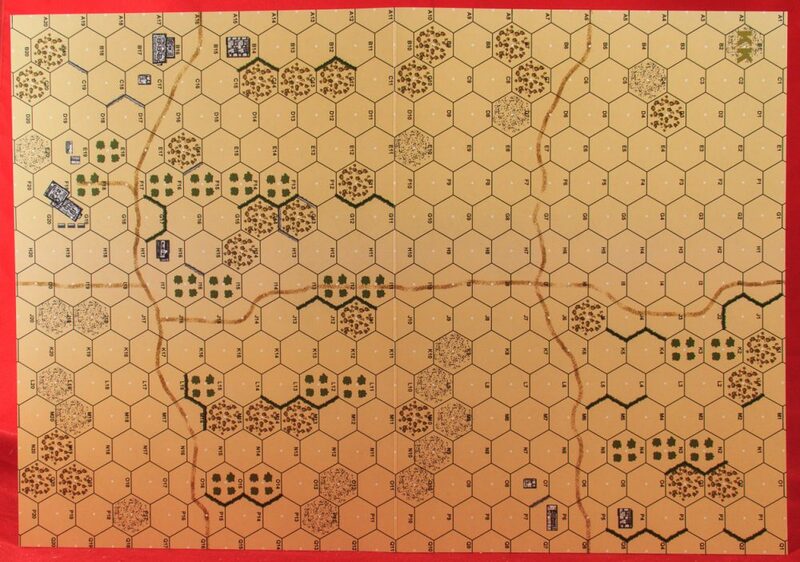 Gallabat is a scenario and map pack from Critical Hit that depicts fighting between British/Commonwealth forces and Italians and their colonial troops in East Africa in 1940-41, with scenarios set in Sudan, Abyssinia, Ethiopia and British Somaliland. 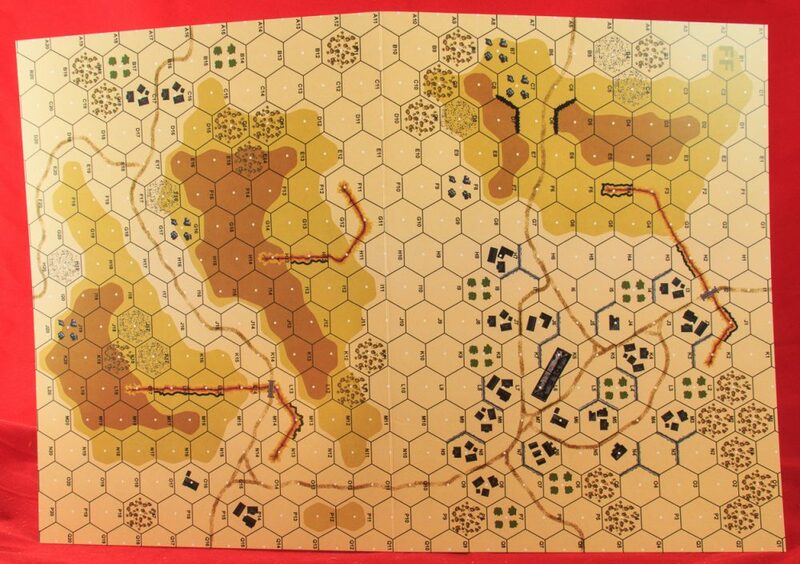 Most scenarios are set during the British liberation of Italian-occupied Ethiopia. The title of the product comes from the name of a small village in Sudan (under British control at the time) on the border with Ethiopia. The Italians took the town during the summer of 1940, but a British force under the not-yet-famous William Slim took it back later in the year. 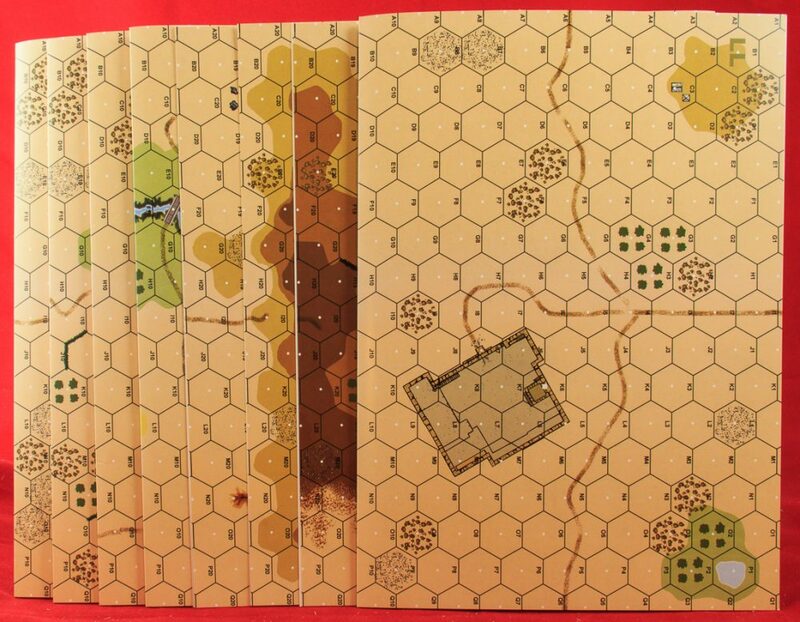 Gallabat is thus a very unusual ASL product, being a desert-themed scenario pack–and one that, moreover, comes with a variety of new desert geoboards to represent the more varied terrain of East Africa. 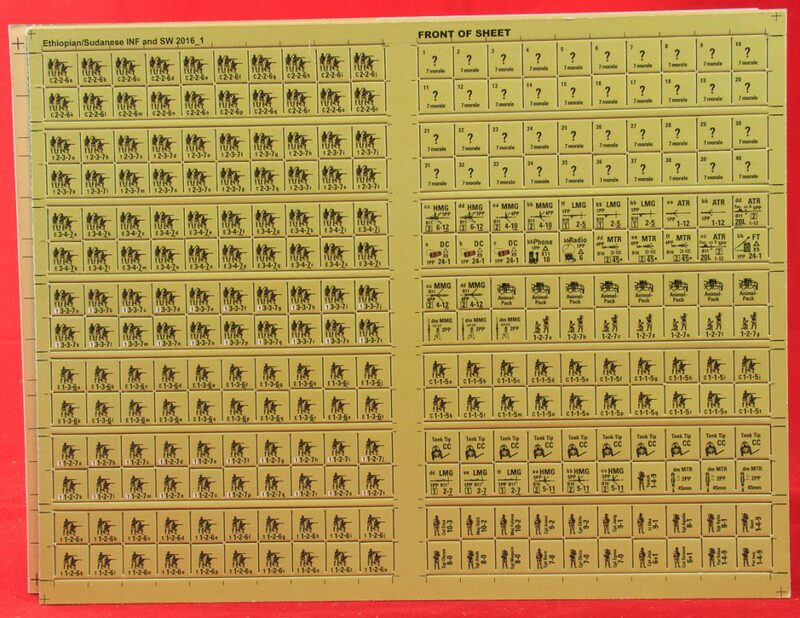 The boards–identified for some unexplained reason as EE, FF, GG, HH, II, JJ, KK, and LL–are 11″x 16″ unmounted (heavy paper) boards of the “Gary Fortenberry” style of geoboard. The artwork is rather plain but the boards are serviceable. A sheet with three overlays is also included. Board EE: Dominated by a board-length depression which itself contains a board-length stream. 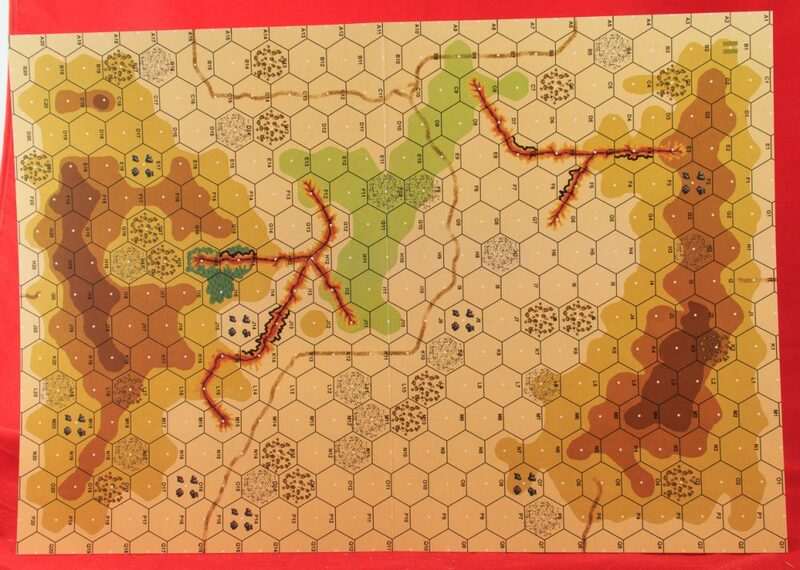 Board FF: Contains three 2-level hills and a crossroads desert village. 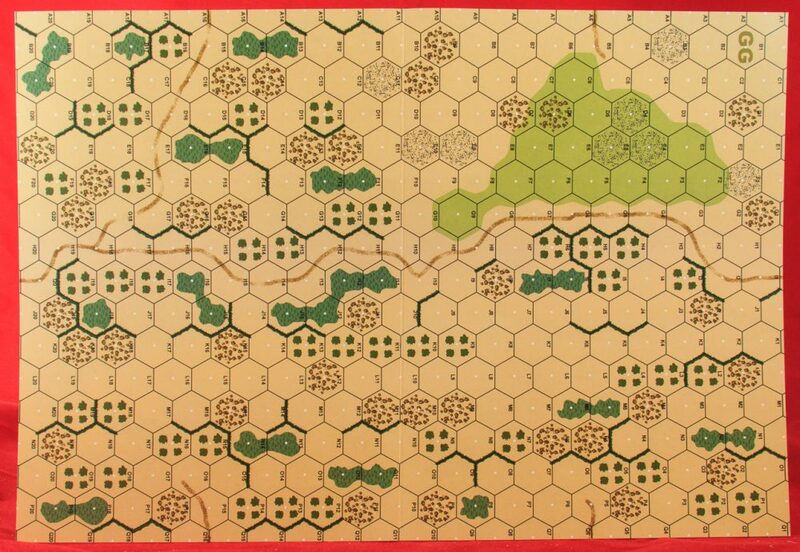 Board GG: Contains a medium-sized depression and a lot of scattered brush patches, scrub hexes, orchard hexes and cactus hedge hexes. Board HH: Flat and relatively empty. Some scattered orchard, cactus hedge, scrub and hammada hexes, as well as a handful of stone buildings. 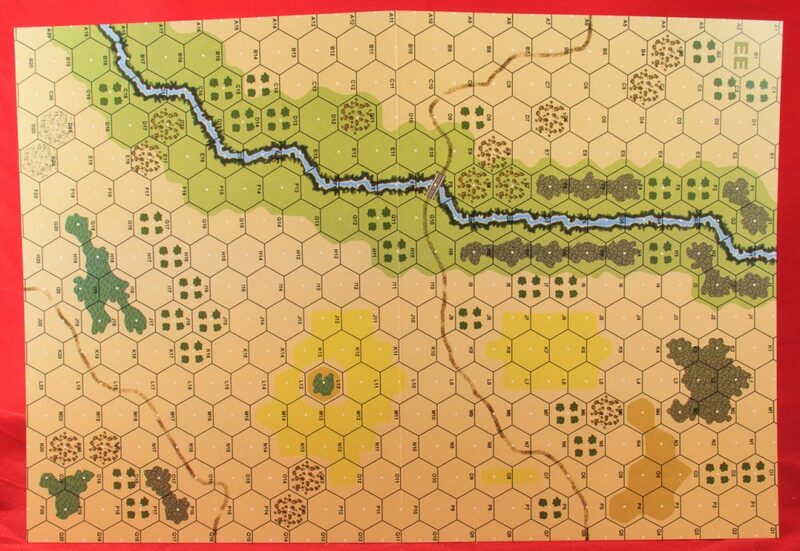 Board II: Contains a large depression, two wadis, and several 1-level hills. It also contains a large desert fort. Board JJ: Features a large 2-level hill on top of which is a little village. 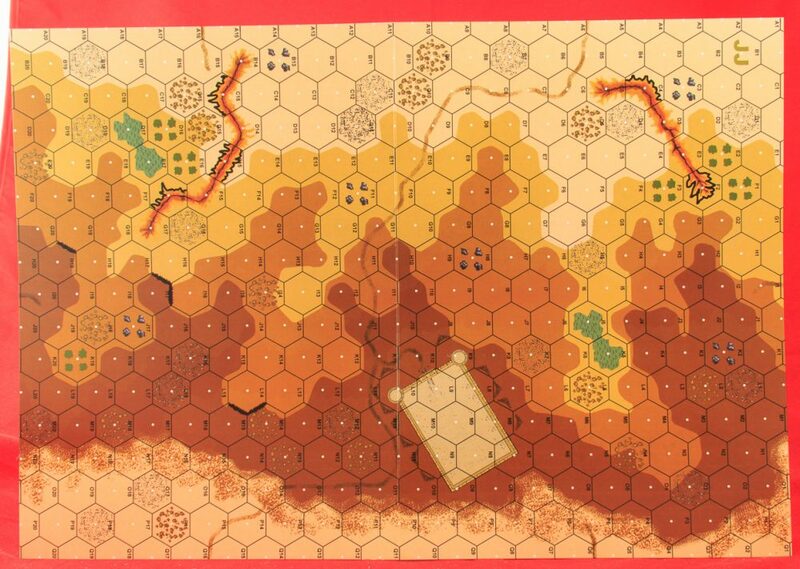 Board KK: Dominated by two fairly large 3-level hills, one on each end of the board; between them is a depression and a couple of wadis. 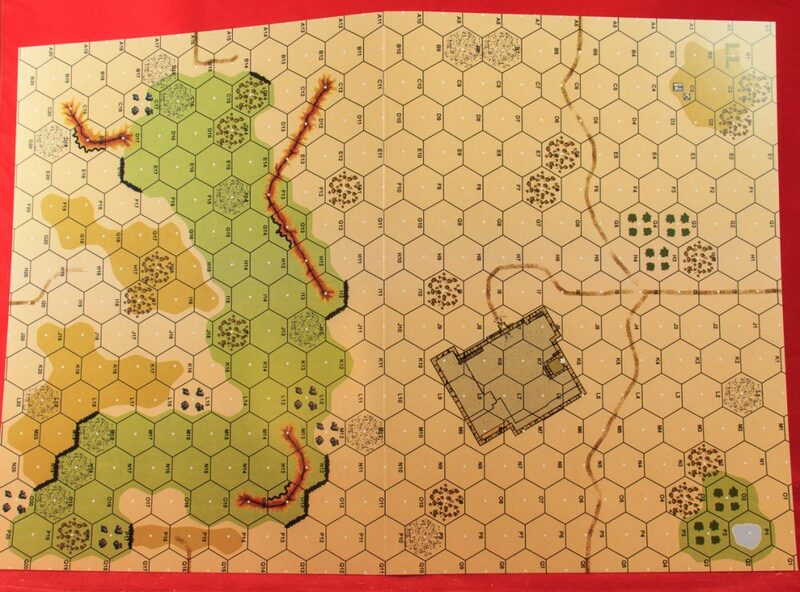 Board LL: Dominated by a huge escarpment, three levels high, with slopes and another desert fort. Overall, the boards are reasonably interesting and would serve well for DYO play. Unfortunately, Critical Hit has a history of not supporting the geoboards it includes with scenarios in future products that use those boards, so Gallabat scenarios and DYO are probably all the use that is likely to be gotten from these boards. 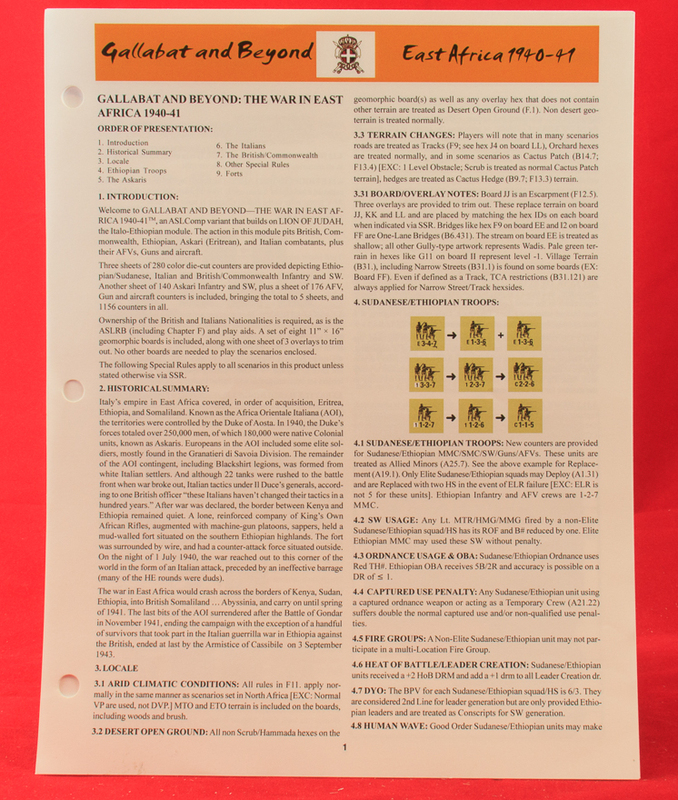 Gallabat comes with 4 pages of rules. The bulk of these regard the units provided, including rules for Sudanese and Ethiopian Troops (which are derived from Lion of Judah, a rip-off of Soldiers of the Negus), for Askari troops, and for British and Italian troops. 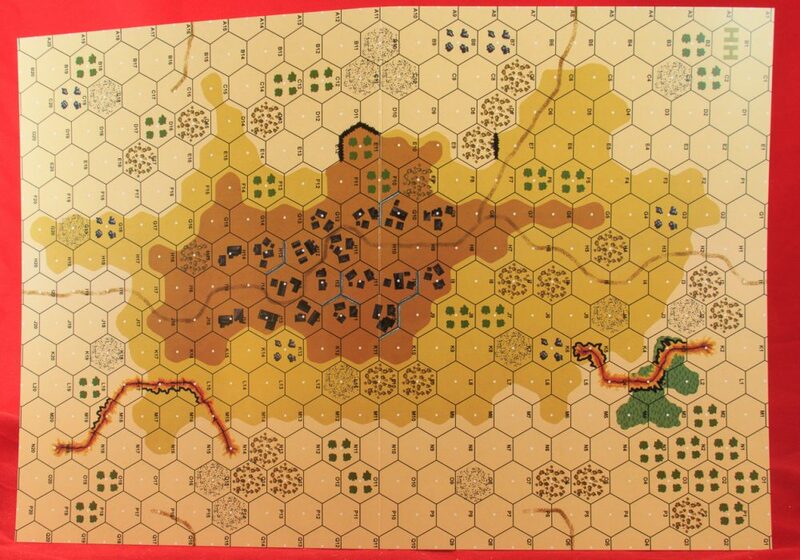 There are also a couple of chrome rules for Camel Cavalry and TNT, as welll as rules for the two forts that appear on the geoboards. 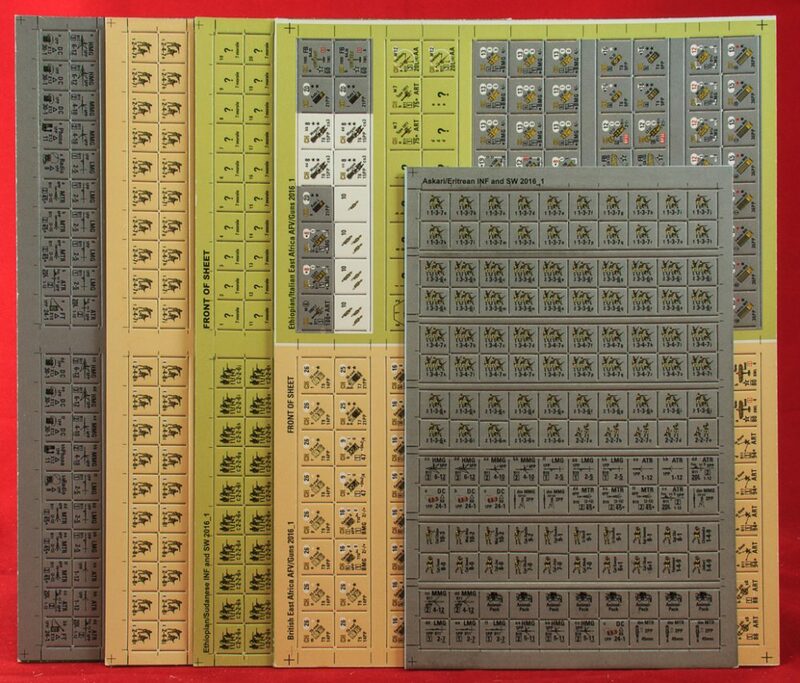 Unlike many other recent Critical Hit products, this product includes credits for design and development of the “originating scenarios and rules.” A glance at the names mentioned on the list suggest that this product may have originated some years ago, perhaps with 8″ x 22″ boards, and Ray Tapio later switched out the boards and modified the scenarios accordingly, finally publishing it. 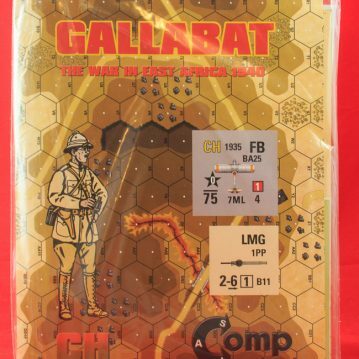 Gallabat comes with a lot of counters–over 1,000, in fact, but most of them duplicate already existing British and Italian counters and are thus not needed. Of the minority of “new” counters, some are dedicated to “Askari/Eritrean Infantry,” i.e., Italian colonial troops. 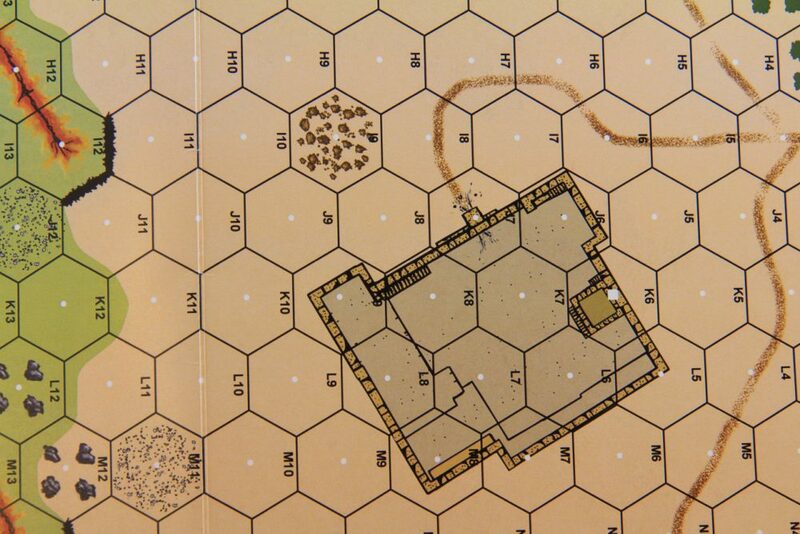 These are 3-4-7 and 3-3-6 squads, and their accompanying leaders and SW, including 2-7 LMG, 4-12 MMG and 5-11 HMG. These counters are all in Italian colors. 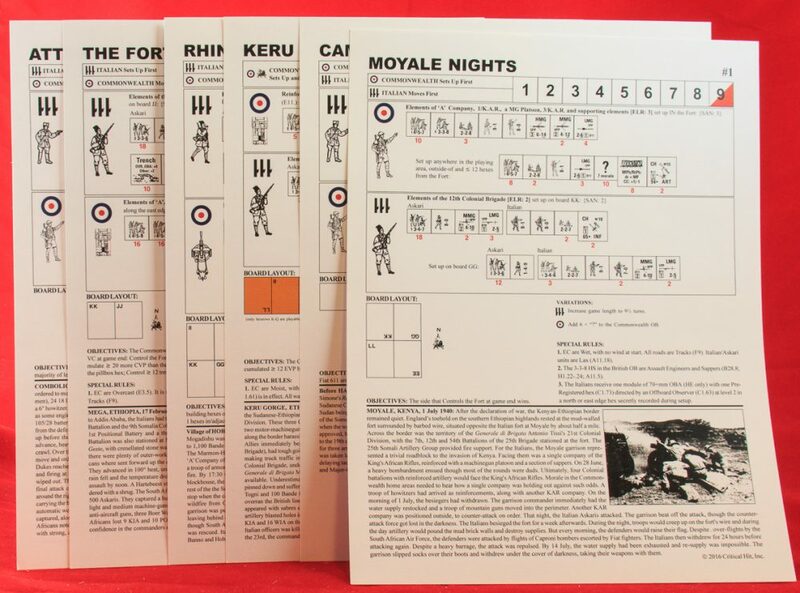 There is also a full countersheet for “Ethiopian/Sudanese Infantry,” which are oddly given American colors. These include 3-4-7, 3-3-7, 2-3-7, and 2-2-6 squads. 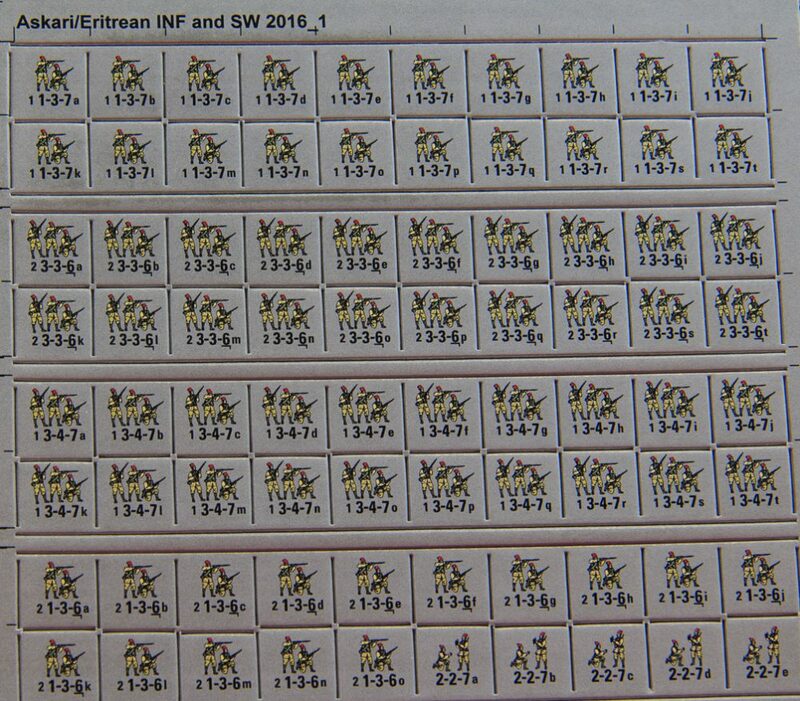 They also get leaders and SW, including 2-5 LMG and 20L ATR (presumably these are Italian SW used by Ethiopian irregulars?). 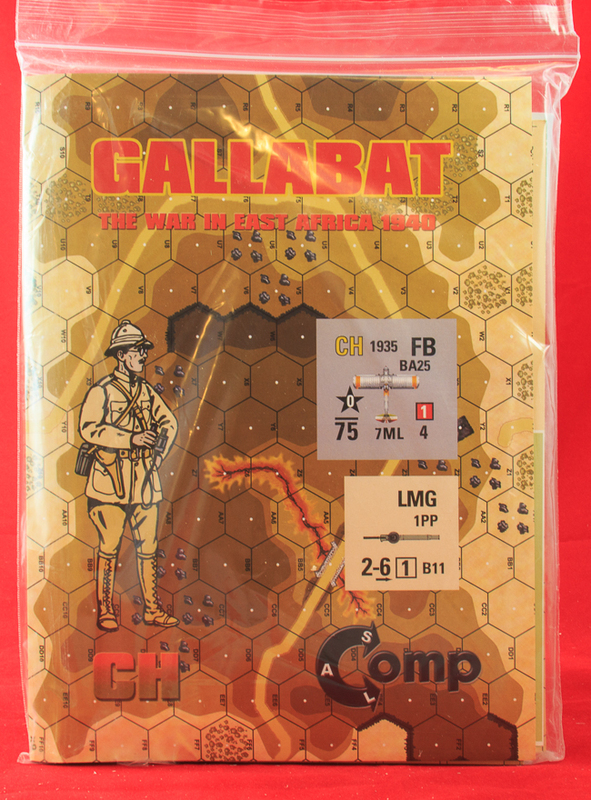 Ostensibly, Gallabat includes enough counters to play all the scenarios in the product but, should that not be the case, the rules tell you not to “whine” about it. Gallabat comes with 12 scenarios. Almost all of them are large in size. Seven of the scenarios have OBA and five of them have Air Support. None of them use Night rules, even though one of them clearly takes place at night. The scenarios tend to be vehicle heavy, averaging nearly 13 AFVs per scenario (both sides). 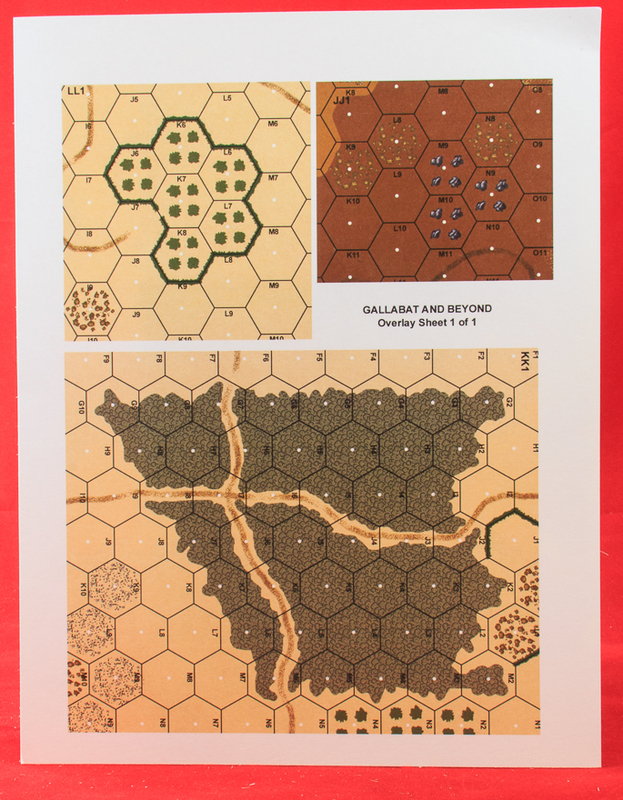 Gallabat might appeal to desert fans or fans of exotic actions–if the scenarios are sufficiently playtested.